ASTRA 2D, a Boeing 376 HP spacecraft built for Societe Europeenne des Satellites (SES) of Luxembourg, is scheduled for launch Dec. 19 aboard an Ariane 5. The 43-minute launch window opens at 9:26 p.m. at the launch site (4:26 p.m. PST; 12:26 a.m. Wednesday, Dec. 20, GMT). ASTRA 2D is the first spin-stabilized satellite ordered by SES, operator of Europe’s leading ASTRA direct-to-home (DTH) satellite system. ASTRA 2D will become the eleventh operational satellite in the SES fleet. 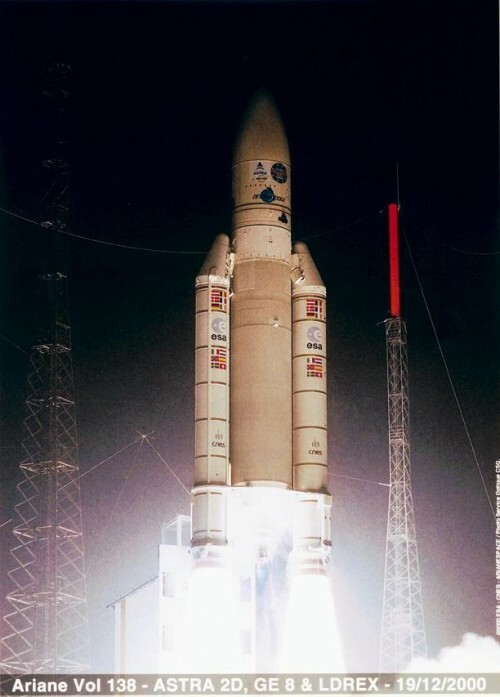 The spacecraft was one of two that SES ordered from BSS in August 1999 to help meet growing demand for digital satellite services at SES’ second orbital slot, 28.2 degrees East. From that orbital slot, ASTRA 2D will deliver digital DTH services to Great Britain and Ireland. “Boeing Satellite Systems is proud of its long and positive relationship with SES,” said Tig H. Krekel, president of Boeing Satellite Systems. “We’ve built seven of the 10 ASTRA spacecraft currently in orbit, and we are building two more satellites right now for SES as well. ASTRA 2D carries 16 active Ku-band transponders powered by 39-watt traveling wave tube amplifiers (TWTAs) manufactured at Boeing Electron Dynamic Devices Inc., (EDD). Based in Torrance, Calif., EDD is the leading provider of traveling wave tubes and TWTAs for the space, military, and commercial communications markets. The satellite’s power is derived from two telescoping cylindrical solar panels manufactured in Sylmar, Calif., by Boeing’s Spectrolab Inc. subsidiary, the leading manufacturer of space and terrestrial solar power systems. The panels feature gallium arsenide solar cells similar to those on many proven Boeing spacecraft. At launch, the satellite will weigh 3,186 pounds; in orbit, ASTRA 2D will weigh 1,816 pounds. Once deployed, the cylindrical satellite will be 26 feet 2 inches tall and 7 feet 1 inch in diameter with its solar panels deployed. ASTRA 2D is designed to have 1600W of power at beginning of life and 1400W of power at end of life. Via 10 satellites at the orbital positions of 19.2 degrees East and 28.2 degrees East, SES’ ASTRA system transmits in analog and digital more than 1,030 different television and radio channels, as well as multimedia and Internet services to an audience of more than 80 million homes in Europe. SES is also a strategic investor in the leading Asian/Pacific AsiaSat Satellite System (34.13 percent since January 1999), Scandinavian Sirius satellite operator Nordic Satellite Company NSAB (50 percent since October 2000), and Brazilian Embratel Satellite Division, operator of the Latin American Brasilsat system (19.99 percent since October 2000).